I won’t be able to visit L’Aquila this year until June to visually measure the recovery efforts from the earthquake which tore the heart out of central L’Aquila and left damage in many other places. When I visit, I will head to my favorite street before the quake – Corso V. Emanuele where before April 6th 2009 university students, teens, couples and families strolled amid shops, restaurants and university buildings. The pace was slow and tourists felt welcomed. April 6th 2011 Georgetown University’s Italian Department invited Anna Tozzi who is in charge of International Relations at the University of L’Aquila to speak about the city’s recovery efforts. She told the audience, “The recovery of the town is linked to full recovery of the university.” To understand her point, realize that the literature, language, and philosophy departments were located in devastated centro. Last April only a few departments had buildings and were functioning- biotechnology, psychology, and medicine. Temporary buildings assist in some continuance of studies, but think of the town of Princeton, New Jersey without a fully functioning university, with extant classes convening near a cow pasture. My posts from 2010 and 2011 on L’Aquila focused on protests, scaffolding, and mostly what was lost. This year I mark the anniversary with a vintage postcard. 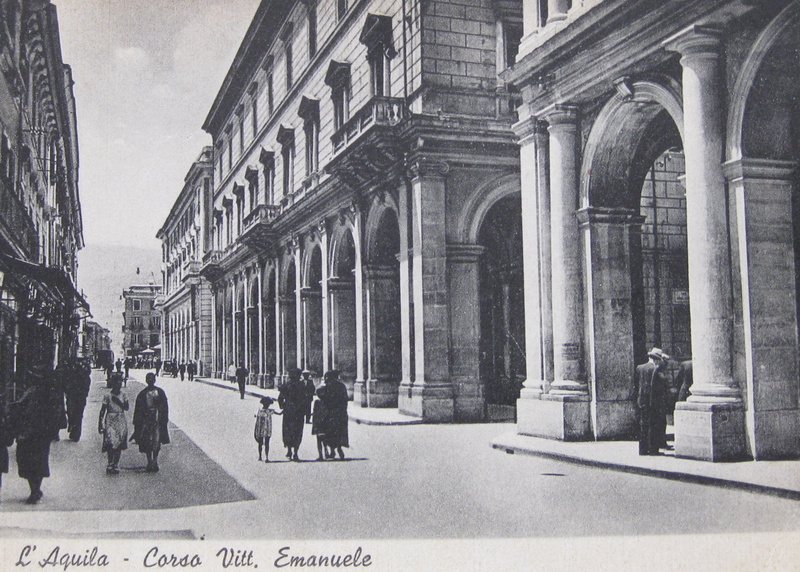 The cartolina shows Corso Vittorio Emanuele without metal bars holding up any facades. L’Aquila has fallen before and this reminds me that it will pick itself up again. I have been told the recovery phase will take 20 years. I plan to see it through on each yearly visit.